The elderly man who was rescued after the level crossing barriers at Polegate trapped him, said he was grateful to the two men who helped him. Earl Collyer, who is known as “the Earl of Polegate” by friends, said the near-miss the afternoon (May 5) was because he did not hear the crossing alarm as the barriers came down. 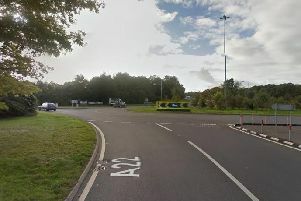 Mr Collyer, 81, of Dover Road, Polegate, said, “I am not against modern technology, and I see nothing wrong with the gates being computerised. “But the alarm, you can hardly hear it, and that is the problem. That wants sorting out. Apparently I am not the only person that this has happened to. Mr Collyer said he is disabled, and suffers with arthritis, so could not move quickly enough to get past the barriers. “There’s no way I could run across that crossing and beat the barriers coming down,” he said. He said something needed to be done about the alarms so that people can hear them, and the same thing does not happen again. Did you witness today’s incident at the level crossing, and do you know the men who helped Mr Collyer? Get in touch by email at eastbourne.herald@jpress.co.uk or call 01323 414483. A Network Rail spokesperson said, “The level crossing at Polegate operates with ‘obstacle detection’ technology which uses radars to detect the presence of any cars, pedestrians, or objects on the crossing. “Just after 3.50pm on Tuesday, the system detected a pedestrian attempting to cross as the barriers had started to lower. The detection triggered the system to halt the barrier sequence and stop the approaching train from passing through until the crossing was clear. “Safety is our top priority at level crossings, and we would like to assure people that in this incident, the technology worked as it should to protect them. “While there was no risk of a train coming through, we do understand that this might have been a unsettling experience for the gentleman involved, and thank the passing members of public for assisting him.